What if your wildest dream came true and it was a heartbreaking experience? We tend to believe that the fulfillment of our fantasies will be satisfying, but I think that’s because so few of us ever realize our most imaginative goals. This isn’t to say that we haven’t actually had wishes come true, in fact if you think about it, “wishes coming true” is a pretty accurate description of Christmas for most children. Parents are generally able to accommodate “Dear Santa” requests because kids tend to dream small and talk big. Fulfilling a Christmas wish list is easy because kids don’t usually ask for something huge like a record deal and a music video. 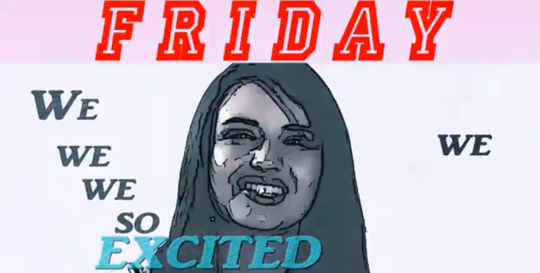 It used to take a ruthless corporate machine to foist something like Rebecca Black’s absolutely ridiculous “Friday” on the general public. An industry was responsible for creating the Godzilla grade monsters we call Lindsay Lohan and Chris Brown, but the digital revolution has eased the major media companies’ stranglehold on the celebrity spotlight. With the advent of reasonably priced, professional grade, digital media processing the formerly ludicrous claims of Andy Warhol became eerily prophetic. 15 minutes of fame is now eminently accessible to the “average” American. An “average” American became a worldwide sensation last week because her mother had the resources to finance her fantasy. While it only took $2000 to both fulfill Rebecca Black’s dreams and crush her heart, the sad part isn’t that she got torn apart by the rabid beast of suburban consumption. What’s sad is that she dreamed too small and sang too big. Rebecca didn’t dream about the art of writing a song and performing it to the world as a declaration of self, she dreamt of starring in a moment that got people to pay attention to her. She didn’t pen the horrifically written “Friday”; she just had the misfortune of innocently choosing it over another more “adult themed” composition of compost. If picking a song for the sake of grabbing attention was dreaming too small, the talking too big came by playing the role of Disney Popster so well that the resulting video is interesting enough to watch while simultaneously being too terrible to like. Rebecca’s adolescent desire to become significant among her peer group worked so well that she’s currently being savaged by a world she never imagined existed. Rebecca believed that if you do something big, people pay attention to you. What she didn’t know was that the attention wouldn’t all be positive. We dream of being celebrities because we believe that life is easier for people who have money and fame… while we sit around tearing them apart. It’s not popular to say, but when our desire to be celebrated defeats our desire to be known, we lose the ability to be loved. Because you can’t actually love someone you don’t know. It only took a few days for the attacks to get nasty; the fat jokes and self-mutilation jabs coalesced is a tide pool where valid criticism partied with petty envy the way iPhone danced with AT&T. If Rebecca were more talented, prettier, or of notable lineage she’d have already been offered a much better, and safer, shot at being worshipped than she found at the puppy mill that gave her way more than the two grand she left on their counter. The sad truth is that even if Walt himself made her a Mouseketeer, she’d still be getting torn apart the way, Hilary, Selena, and Miley do. Had Rebecca dreamed a dream about music being a craft and an experience, as opposed to a means to an end, she might have spent the money on music theory and composition instruction or vocal training. A more responsible parent probably would have looked to protect their child’s innocence instead of indulging their naivete. I think we can reasonably speculate that these options weren’t really considered because neither the industry or the end consumer cared about Jessica Simpson and Katy Perry’s talents while they were wearing sweaters and singing about Jesus. In a theater of garish shouting, getting the audience’s attention is significantly more important than doing something noble, or of lasting import. I’m pretty certain that celebrity isn’t achieved by something a person can do, but rather by something that someone is willing to do. In this case a Vanity Label was willing to do the work, A mother was willing to foot the bill, and now a 13 year old gets to pay… for the attention.